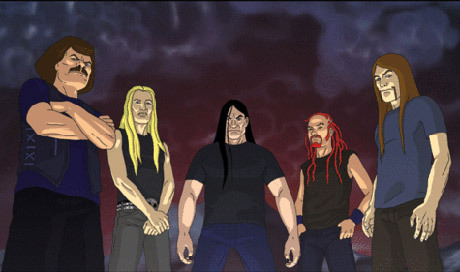 Animated death metal crew Dethklok's last official album release was 2012's Dethalbum III, but the fictional band will unveil a host of new gutturally-voiced whip-crackers come October when the Adult Swim network airs a new rock opera titled Metalocalypse: The Doom Star Requiem. News of the hour-long program came in a tweet today from Metalocalypse creator Brendon Small, who provides the voices on the show for the group's singer Nathan Explosion, drummer Pickles and lead guitarist Skwisgaar Skwigelf. Small also writes Dethklok's music, as well as performs vocal and guitar duties onstage for the flesh-and-blood variation of the act. His tweet described the project as "A 1hr complete ROCK OPERA w/ 1 hr of brand new original music." A press release from Adult Swim, meanwhile, notes that The Doom Star Requiem continues the storyline left off from the events of the show's fourth season, with the act trying to track down abducted guitarist Toki Wartooth. "With his life in danger his only salvation can come from the four most selfish human celebrities on earth — his bandmates, extreme metal band DETHKLOK. Will they be able to get past their own egos to help someone besides themselves?" Details are still pending on the music, but here's hoping a couple of Snakes 'N Barrels songs sneak their way into the no doubt brutal rock opera too. An exact air date has yet to be delivered for Metalocalypse: The Doom Star Requiem.